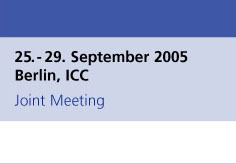 The official Awards Ceremony will take place on Wednesday 28 September 2005 between 16.30 and 18.00 hrs, in Hall 8. Awards presented at this ceremony are appropriately marked below. Some awards will be presented during their respective scientific sessions; the exact times of these presentations can be established by referring to the sessions in the programme using the identification codes provided below.